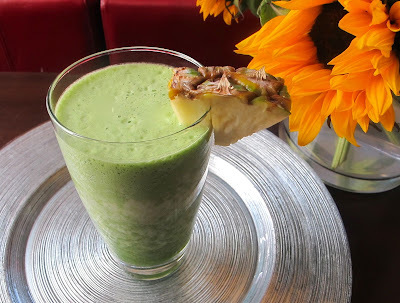 I have been making more of these every week, it is such a good way to get more vitamins and nutrition if not getting enough servings of vegetables. The green drinks are easy to make and the possibilities are endless. 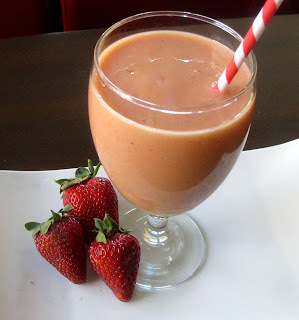 Combine all ingredient in a blender and blend until smooth. 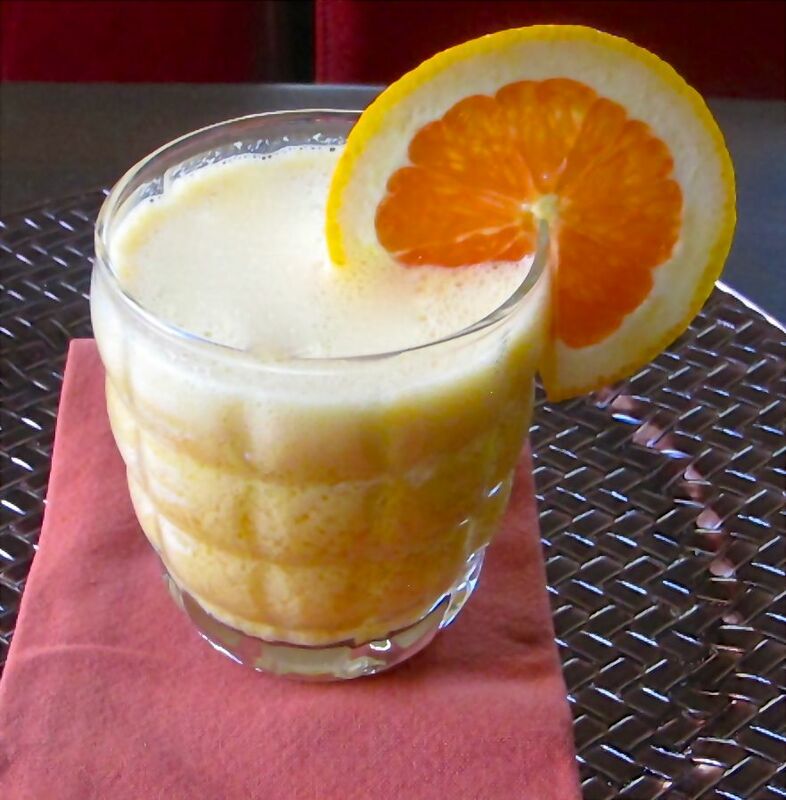 A quick, fresh smoothie. If you have leftover bananas, simply peel, slice them and put them in the freezer. The frozen bananas make the smoothie creamy and cool, ready anytime. I am so excited to try this again with different herbs and sauces. It is a really quick dinner to put together but best to have everything prepped before starting. I put this over organic rice pasta, but any pasta, rice or just served by itself would work. In a large saute pan over medium heat, add 1 Tablespoon of olive oil and 1 Tablespoon butter. Add mushrooms and saute, add leeks and cook until softened. Add tomatoes and saute several minutes. Add wine and stock and cook until reduced. Remove pan from heat and add sour cream and parsley, salt and pepper. Cover and set aside. 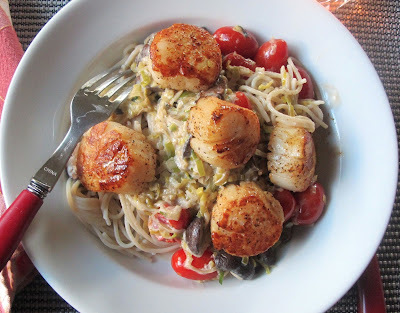 In another saute pan over medium high heat with 1 Tablespoon olive oil, add seasoned scallops and cook 2-3 minutes each side. Remove and place on top of mushroom and leek mixture. Drizzle of Meyer lemon olive oil, if desired. 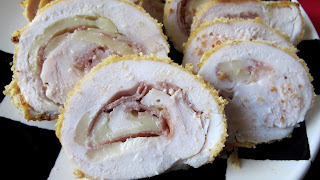 These stuffed chicken breasts can be served whole for a dinner entree or cooled and sliced into pinwheels for an appetizer. 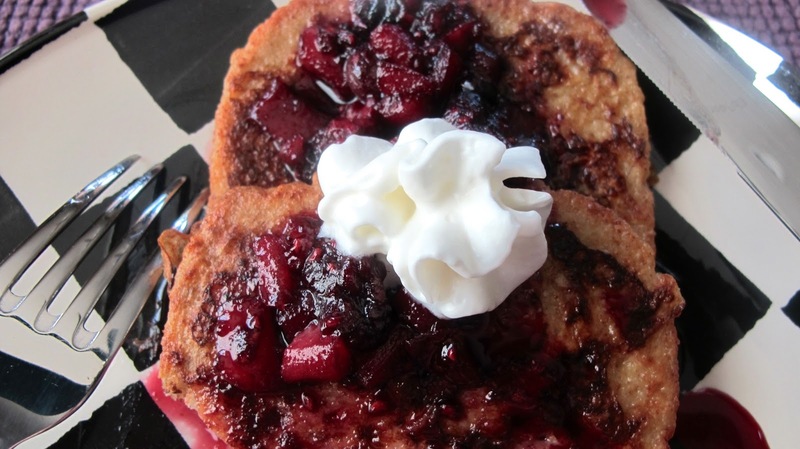 To make these gluten free, I used a gluten free all purpose flour and to substitute panko breadcrumbs, used the inside of gluten free (crusts removed) Udi's bread, cut in cubes and toasted in the oven, and ground in food processor. Lay each chicken breast between 2 pieces of plastic wrap. Using the flat side of meat mallet, gently pound the chicken to 1/4 inch thickness. Take care not to cause meat to tear or create holes. 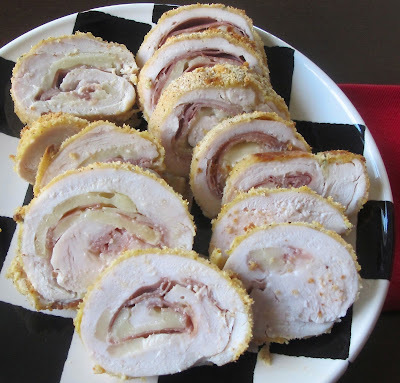 Place 2 slices of cheese on each breast and 2 slices of Prosciutto, leaving a 1/2 inch margin on all sides. Tuck in the sides of chicken breast and roll up tight, squeeze the log gently to seal. Secure with toothpick. In a shallow dish, season the flour with Alfies seasoning. In another dish, beat together egg and water. seasoning, lemon zest, and olive oil. The oil will help brown the crust. Lightly dust the chicken roulades with flour, then dip in the egg mixture, then gently coat with breadcrumbs, repeat with each breast. Place the roulades on a parchment lined baking sheet and bake approximately 20-25 minutes or until browned and cooked through. Remove from oven and allow to rest several minutes before cutting open. 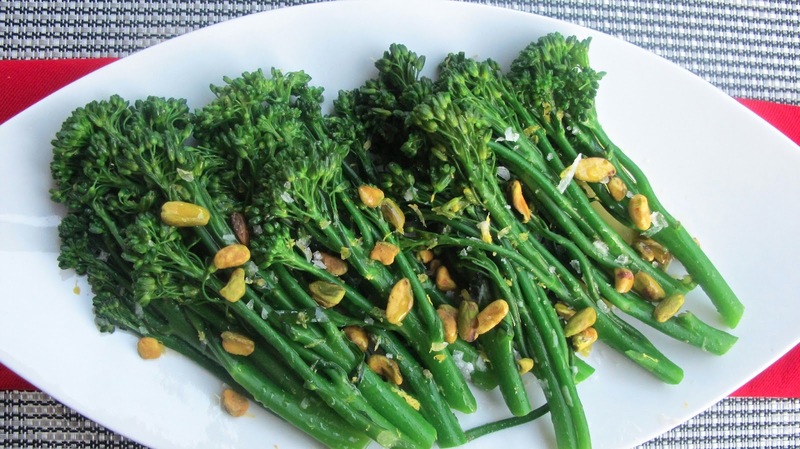 Broccolini has a thinner stock and sweeter taste than broccoli. It is best blanched and can be held for a quick saute just before serving. Bring a pot of salted water to a boil. Add broccolini and cook until tender, about 2 minutes. Using tongs, take broccolini out and immediately plunge into a bowl of ice water. Add butter and olive oil to a saute pan over medium heat. Add garlic and broccolini to pan, sprinkle with Alfies seasoning and zest of lemon. Saute about 2 minutes, until warmed throughout. Transfer to serving dish and top with Pistachio nuts. Any type of bread can be used, for today I used brown rice bread, which is gluten free. 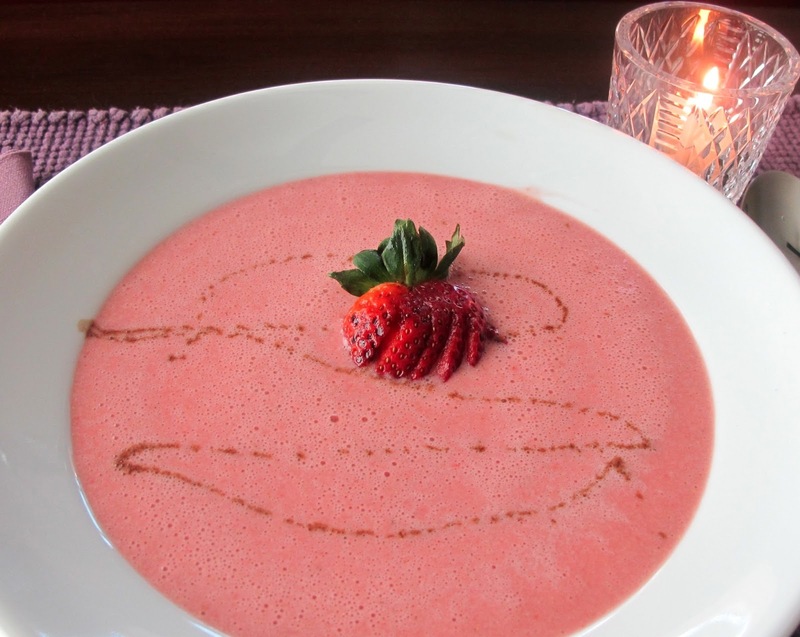 A variety of fruits can be used, this sauce was made with frozen strawberries, blueberries, and raspberries, and a pear. Mix all ingredients together in a pie pan and set aside. In a small saucepan, over low heat, combine berries, pear, maple syrup, orange juice, and ginger. Heat several minutes until softened and liquid is reduced. Remove ginger. Keep warm. Soak bread in egg mixture for several minutes, remove and set aside. Add 1 Tablespoon of butter in a large non-stick pan over medium high heat. Place coated bread in pan and cook each side 2-3 minutes until caramelized. 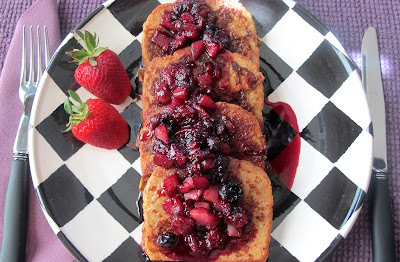 Remove bread to serving plate and top with berry sauce. This soup would be so refreshing and bright on a hot summer day. I received so many fresh strawberries and wanted to combine them with a little basil, also love the addition of reduced balsamic over fresh strawberries. Pour into soup bowl and drizzle with balsamic syrup, if desired. I found some baby Bartlett pears at Trader Joe's and decided to stuff them with cheese, and top them with some toasted walnuts. But how to classify them, an appetizer? Or dessert? So, decided right after dinner as a cheese course. But then again, maybe just for lunch. What do you think?? Wash pears, slice in half and remove core and stem. In a saute pan over medium heat, heat butter and put pears cut side down, saute until browned (about 5 minutes), turn over, cook another 2 minutes. Mix blue cheese and cream cheese together. 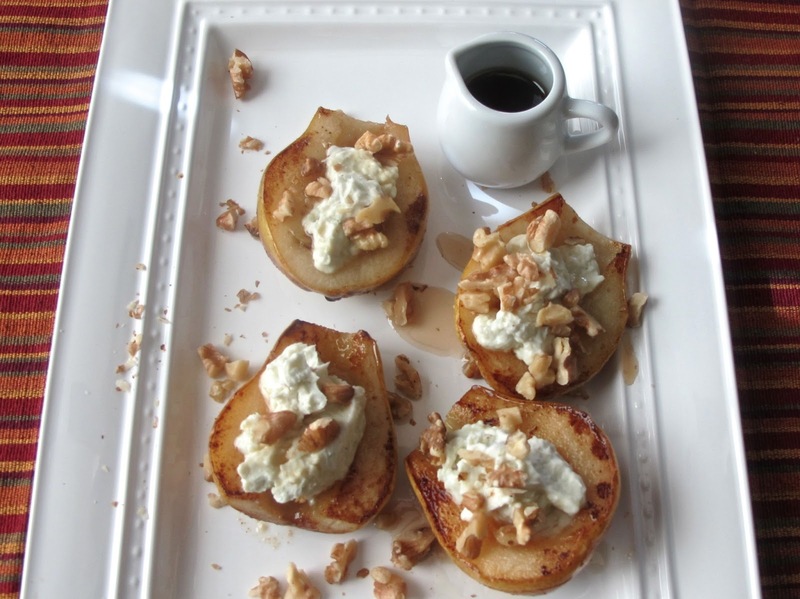 Using tongs, take pears out of pan, place on serving dish. If needed, to make pears lay flat, cut a small slice from bottom. Stuff with cheese. Sprinkle with walnuts and drizzle with maple syrup. 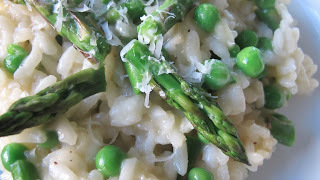 We cook risotto often, it is a great showcase for different menus. The restaurants load it with heavy cream and tons of butter, which is always good. But, the result of ladling stock to the rice and then stirring to absorb the stock, creates a creamy dish without the addition of cream and extra butter. There are many creations to be made with risotto, this is the basic, with spring vegetables. Simmer stock in saucepan over low heat. In a large, heavy saucepan over medium heat, heat butter and olive oil. Add shallot and onion and saute until softened, do not brown. Add the rice and stir until each grain is well coated with oil and you see a white dot in the center. Add the wine and stir until completely absorbed. Add a ladle of the simmering stock to the rice, stir. Wait until the stock is almost completely absorbed before adding the next ladle. Repeat several times, waiting for the stock to be absorbed each time. When the rice is almost tender and looks creamy, about 20-25 minutes, remove from the heat and stir in cheese, asparagus, peas and lemon zest. Add another 1/4 cup of stock, season to taste with salt and pepper. 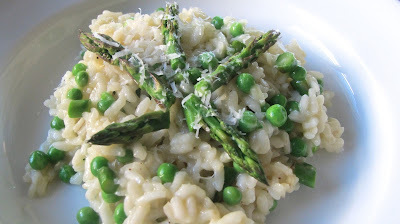 Garnish with asparagus tips and a little dusting of Parmesan. 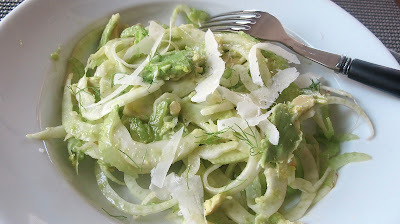 I usually add fennel to a salad, but today decided to make it the star of this crunchy, refreshing salad. Finely slice (preferably with mandoline) or a knife, fennel bulbs and celery stalks and put in a large bowl. Add onion and chill until ready to serve. When serving, add avocado to salad and toss with dressing. Place on individual plates, top with shaved Parmesan and garnish with fennel fronds. 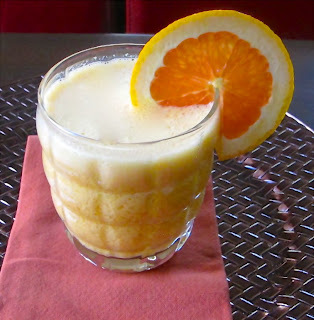 Because I make this so often, when Melody asked me if it was on the blog, I said probably. But when I checked it wasn't. This is so quick and easy, good along side many grilled vegetables, on a chicken sandwich, or on top of salmon. It is best if made a few hours ahead to allow the flavors to develop. Check for seasoning before serving since the amount of curry and lemon may need to be adjusted. Mix the ingredients in a small bowl and refrigerate several hours, add more lemon or curry as needed. 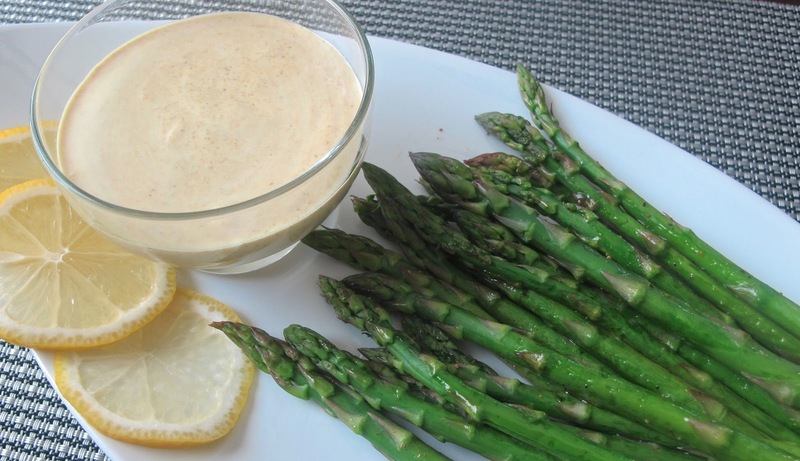 On a baking sheet lined with foil, place cleaned and trimmed asparagus. Lightly coat with a drizzle of olive oil. Sprinkle with Alfie's seasoning and roast about 10 minutes (depending on thickness) until tender. Remove from oven and serve, can also be served at room temperature or chilled.